Iconic Indian cricketer Sachin Tendulkar's feat of 100 international centuries has fetched him a round of applause from the Time magazine which said that the unprecedented achievement has given him the right to decide when to retire from the game. "Having borne the weight of his nation's dreams for so long, and with such uncomplaining grace, Tendulkar has earned the right to keep going, to keep achieving. Don't encumber him now with speculation of retirement. Let Sachin play," said a write-up in the magazine. "For Tendulkar, arguably cricket's greatest-ever batsman, the pursuit of this 'ton of tons' has been unusually tortuous: he scored his 99th a year ago, then went through what, by his stratospheric standards, must rank as a lean patch. In 33 attempts at bat, he twice notched up scores of 90 or more, only to fall agonisingly short of the Big One." 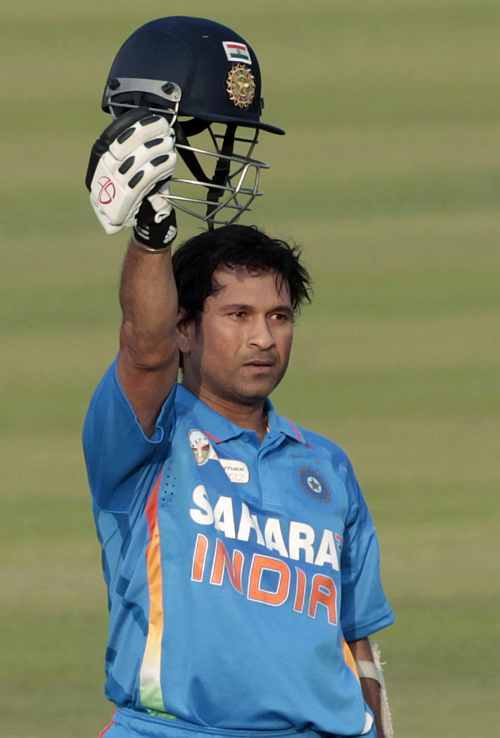 The magazine stated that the abundance of Tendulkar's talent left little doubt that such a feat was gettable for him. "His talent is so immense, there was never any doubt he would get there, it was only a question of when and where. Now that he has, some will cavil that the occasion did not match the achievement: he got the runs against Bangladesh, one of the minnows of the game," it said. "It will be suggested that now he's reached the milestone, Tendulkar should consider hanging up his batting gloves...If Tendulkar leaves now, commentators will gently suggest, it will have been with the greatest possible flourish: the 'ton of tons,' to go with India's World Cup win last summer. "But this is all nonsense. Great sporting achievements set their own landmark: they don't need to occur on especially haloed turf and at an especially propitious hour. Pele's 1,000th goal did not come in a World Cup final, it was in the Brazilian league. Muhammed Ali's comeback from being barred for refusing to fight in Vietnam was not against Joe Frazier or George Foreman, it was against Jerry Quarry."